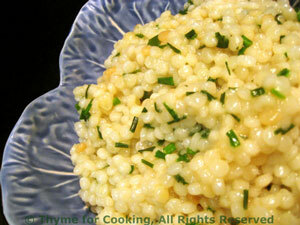 Pearl or Large Couscous, Thyme for Cooking quick, easy side dish. This is slightly different than regular couscous. It's larger than traditional couscous with a pearly, luminescent finish. The texture it similar to that of barley, moist and a bit chewy. Substitute Basmati rice. Uncover and drain any excess liquid. Fluff with fork, add chives and serve.